A highly selective molecularly imprinted solid-phase extraction (MISPE) combined with liquid chromatography-ultraviolet detection was developed for the simultaneous isolation and determination of four Sudan dyes (I, II, III and IV) in egg-yolk products. 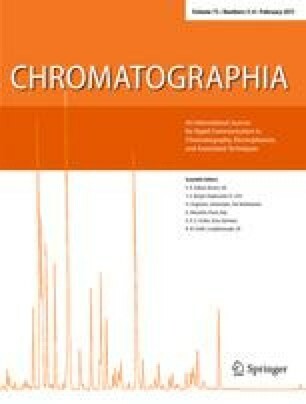 The imprinted microspheres synthesized by suspension polymerization using phenylamine–naphthol as mimic template show high selectivity and affinity to the four kinds of Sudan dyes and were successfully applied as selective sorbents of solid-phase extraction for the simultaneous determination of the four Sudans from egg-yolk samples. Good linearity was obtained in a range of 0.062–10 μg g−1 and the average recoveries of the four Sudans at three spiked levels ranged from 94.1 to 102.5% with the relative standard deviations less than 5.8%. The developed extraction protocol eliminated the effect of template leakage on quantitative analysis and could be applied for the determination of Sudans in complicated food samples. The project was sponsored by the National Natural Science Foundation of China (20905019, 21011140338), the Natural Science Foundation of Hebei (B2010000209) and the Natural Science Foundation of Hebei University (y2008137).